Want to organize every room in your house? Well then don’t miss out this opportunity presented to you by Hearstmags and the Container Store. 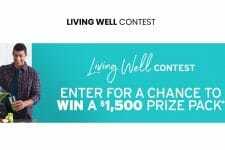 Get in their latest competition for a chance to be one of the happy 10 winners to get each a $500 Gift Card, to spend at the Container Store. The closing date for this contest is February 11, 2019.